About Us - INVICTUS RANCH RABBITRY-Where we have lotzabunnies! I have been raising rabbits off and on for more than 30 years now, although this go-round has really taken hold over the last 15 years. I started off with some cast-offs, although some were very nice-looking pedigreed rabbits and crossbreeds, I quickly figured out it cost just as much to feed and house pedigreed rabbits as crossbreeds. I have New Zealand Reds, Whites, Blues, Blacks and Brokens. Although I primarily breed meat rabbits, I thoroughly enjoy showing some of my bunnies, and take several weekends each summer going all over Oregon and parts of Northern California to the shows. I take care of a large garden and fruit trees, a half dozen or so chickens, a small flock of ducks, a small herd of Boer goats, my elderly mother and the best dogs in the world, my 4 Dobermans. It is amazing to watch them guard the bunnies from other dogs, bad opossums, raccoons and any human trespassers. For more on rabbit clubs, see the club links page. I have been a bit busy lately since I retired so I may not get back to you the same day you email. Thank you for your patience and for visiting my web site. 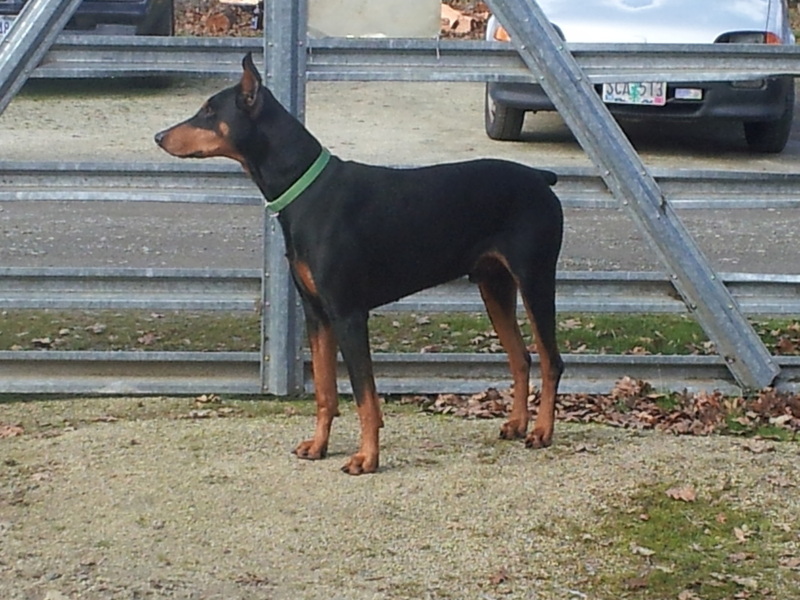 Zeus, my service dog, on the alert for trespassers! Invictus Ranch is located near Central Point, Oregon. (Correct pronounciation is "Orr-ih-gun", not "ORR- EEE-gone"!) Living here about thirty-three miles north of the California - Oregon border puts us right in the middle of everything, and about halfway between Portland and San Francisco. Crater Lake is one of the great natural wonders of the world is only eighty miles away and can be enjoyed year round, although the snow gets very deep in winter and sometimes they close the road. Museums of all sorts, and historical landmarks abound in this quaint town settled by pioneers who came seeking gold, but found more wealth than they knew. Listeners come to hear many wonderful concerts of all genres of music held yearly at the Britt Festival in Jacksonville, just five miles west. Enjoy an Evening of Great Entertainment in Ashland. 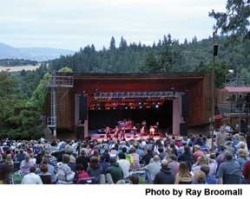 For those who wish to enjoy a more culturally enriched time, there is the Oregon Shakespearean Theater in Ashland. So close to the beach. The scenic Oregon beaches are only a two-and-a-half-hour drive to the west. This is Chetco Point near Brookings, OR. In the winter, snow-covered Mt. 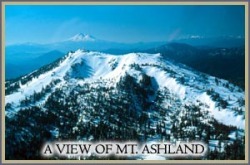 Ashland (seen at right) is 20 minutes away for great skiing, snowboarding, skijoring and snowtubing. With a world class lodge, restaurant and bar, it a great way to enjoy some of the premiere snow in Oregon. On the northern edge of Medford, just across the Rogue River are the shadows of the Table Rocks, (seen at left) where you can hike up several trails and view native wildlife or wildflowers on a nice spring or summer's day. They are just two plateaus in the Pacific Crest mountain range around us. There are also rivers, lakes, and streams in the surrounding areas that are full of fish and surrounded by pine, fir, cedars and madrone forests where many varieties of birds flit through the branches and deer and elk still forage after dawn and dusk near the freeways in meadows just for you to see. What an incredible place to live!